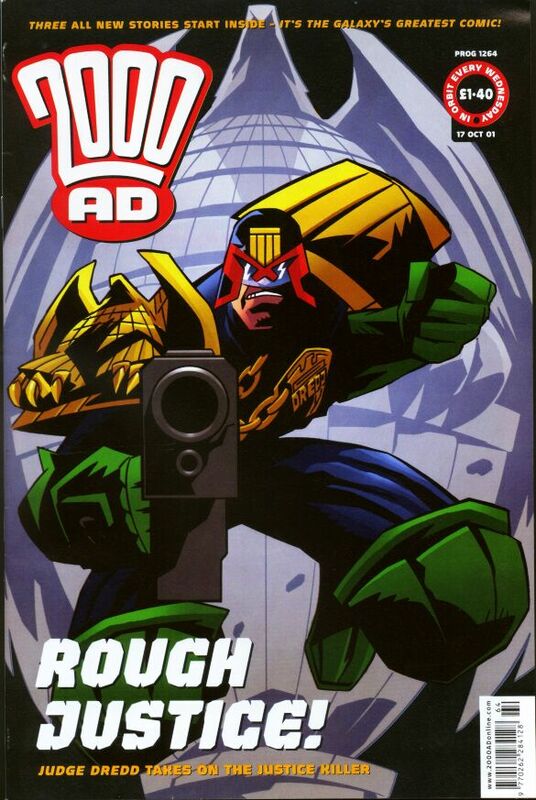 The Chief Judge's Man is a near-miss of a Dredd sequence: a long-form story that's pretty good, and very nicely executed in some ways, but doesn't quite live up to its promise, mainly because its structure keeps promising a twist that never arrives. The premise that the first episode sets up--a lone lunatic killing the enemies of Justice Dept. may actually be being controlled by Chief Judge Hershey--is a solid one, and what we've come to expect from John Wagner is that Hershey's involvement is probably not what it seems but might be something even more surprising. That's not what happens here, though. DeKlerk (who shares his last name with a former South African president) is introduced midway through the first serial, in a scene that signals "newly introduced character is sinister," which indeed he turns out to be barely more than a dozen pages later. So the plot shifts from "is Hershey the secret force behind Armon Gill?" to "when will Dredd figure out that DeKlerk is the secret force behind Armon Gill?" 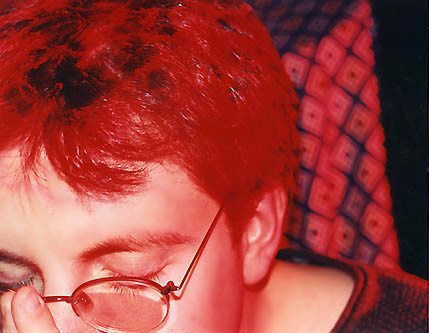 --it becomes a detective story whose readers know more of the solution than the protagonist. By the time the plot makes its second shift, to "...well, now Dredd's figured out that DeKlerk is" etc., the story's run out of steam: having Gill try to kill Hershey isn't especially suspenseful, becuase Hershey doesn't actually get to do anything except shrug "always knew Chief Judges didn't last long." That highlights a surprising thing about Judge Hershey, which is that she's still pretty much a black box--we don't really know anything much about what drives her, or what she's like other than "very competent." 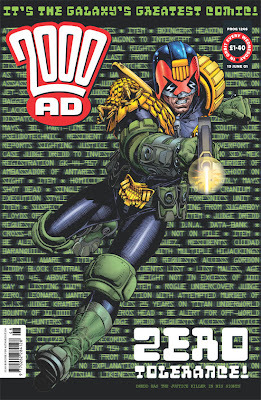 And this is after several decades of intermittent appearances in Dredd, not to mention 25 or so episodes of her own series (mostly unreprinted) and a Neil Gaiman-written short story (recently reprinted in Sweet Justice , if Kindle counts as print). Is she capable of skullduggery along the lines of manipulating Gill? 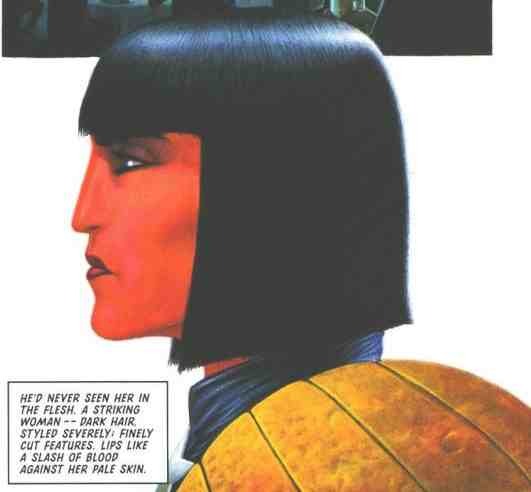 Well, maybe, as subsequent stories have suggested--but at this point in the series she was effectively the character we see in Colin MacNeil's image on the first page of "On the Chief Judge's Service" (below), a glyph with perfectly shiny hair, in perfect profile. I don't tend to play the casting game with comics, but I always imagine her being played by Anjelica Huston. Splitting the story into two acts separated by a couple of years, though, was a great idea, and another example of Wagner playing the long game--it's easier to imagine the devoted servant Gill flipping out and revolting after being incarcerated for ages. So was splitting the first act into halves (separated by 15 weeks' worth of stories, including Garth Ennis's "Helter Skelter," which we'll get into next week): it makes "On the Chief Judge's Service" more suspenseful if he's been at large for a while. As for "Revenge of the Chief Judge's Man": it's good to see John Burns back for a story involving Judge Edgar, and it's a pity she doesn't get much time on panel. (When he gets to draw action or nature scenes, he's in his element. I particularly love his Texas Ranger and the scene with the vultures and the mesa that follows it, because it's obvious how much fun he had painting them.) The "prisoner freaks out and tries to go over the wall" routine is the kind of cliché I'd have expected would have vanished from 2000 AD around the time of "Harry Twenty on the High Rock," although on reflection it echoes the "Dear John letter" theme of Gill's experience. Once Dredd works out the mystery, though, the final few dozen pages of the story are a foregone conclusion, which is bad news for a thriller. The Gill thread and the DeKlerk thread resolve at the same time rather than together. There's some smart writing in the final scenes--I grinned at "a sixteen-lane speedway all the way to the Hab Zone without the crime problems of the overland route"--but after all of the story's intimations that the readers don't actually know everything there is to know about this situation yet, it's a letdown when it turns out that we do. As a side note, I get that it'd have been hard to feature Armon Gill on the cover of 2000 AD, since he keeps changing his appearance, but the relevant covers for this sequence are nearly all evergreen shots of Dredd. Only the cover of Prog 1246, above, makes any reference to the story itself--and that only in its background text. 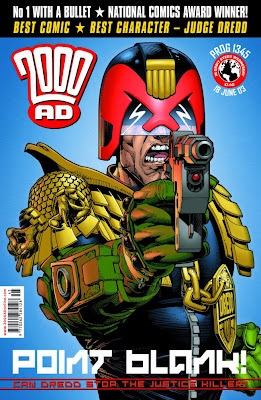 Next week: The Carlos Ezquerra Collection, a.k.a. "Helter Skelter," a bunch of Cursed Earth Koburn stories, and change.